I have lots to share with you today, so let’s dive right in, shall we? I made pretty good progress on the fridge/range wall yesterday! I got the drywall taped and mudded (with the exception of that one area above the door…oops! ), and then got all of the cabinets installed. In case you’re confused, the wall of cabinets is on the wall to the right of this one. The area on the left with no drywall is where the fridge will go. I cut out the drywall and removed a stud (non-load-bearing wall) so that the refrigerator can be pushed back further and look more like a cabinet-depth refrigerator. I gained about 4.5 inches of depth by doing this. It’ll have a cabinet built all around it, so the wall won’t show at all when it’s finished. I kind of lucked out since that wall on the other side is covered in 1 x 10 lumber and then drywalled over that. 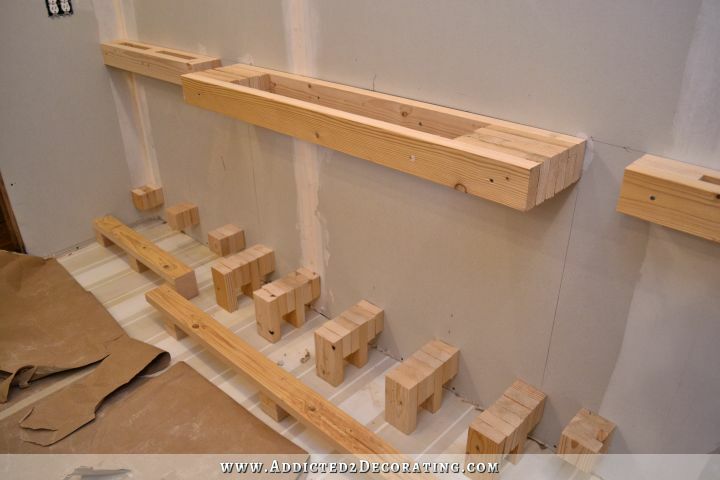 Most walls are just drywall attached to the studs. If the other side had just been drywall, I would have needed to come up with a way to frame out the bumped back section for the fridge. But those already-there 1 x 10’s provide all the framing I’ll need for that area. I’ll just paint it the wall color so it’ll look more finished. 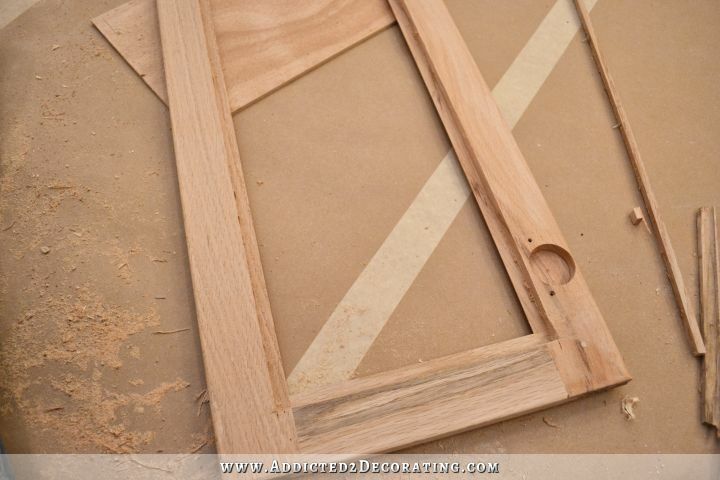 Yesterday I mentioned that I found a way to remove the center wood panel on my cabinet doors without using a router to get them ready for glass inserts. This is so easy!! First, working on the back side of the door, I used a piece of 1 x 2 lumber and clamped it down to the cabinet door about 3/8-inch from the inside edge of the frame. 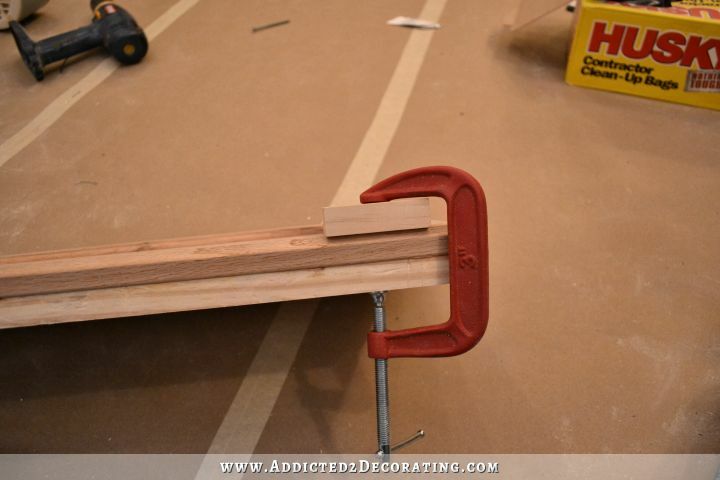 Keep in mind that when you use C-clamps, you really should use a piece of wood on the opposite side of the item you’re working on as a “buffer” between the clamp and the item so that the clamp won’t leave indentations in the wood. With the guide in place, I used my Dremel Multi Max with a wood blade on it, put the back of the blade flush with the side of the guide, and cut right along the 1 x 2 guide. I cut until I felt a little “give” and knew I had cut all the way to the center panel. And of course, I did that all the way down the guide. I had a new blade on my Dremel, so it cut really fast. I timed it to see how long it took, and the long sides took 2 minutes 18 seconds to cut. The smaller sides took about half that. So factoring in time to move the guide and clamps to the four sides, I would say that each door took about 10 minutes. And the results were even better than I expected. And now I’m ready to take these doors to the glass shop and have glass cut and installed. I’ll just let the glass shop do the installing for me since they know what they’re doing and have all of the adhesives, tools, and whatever else is needed already on hand. But I’ll wait until after the doors are painted to do that. Well, you should. If I had to choose between a router or a Dremel Multi Max, I’d choose the Dremel, hands down. I’ve gone all of my DIY life without owning or using a router. Evidently I can always find another option for using a router, because not only do I not own one, but I’ve never borrowed one either. This Dremel, on the other hand, is worth its weight in gold. Ever since I bought it, I have used it over and over and over. 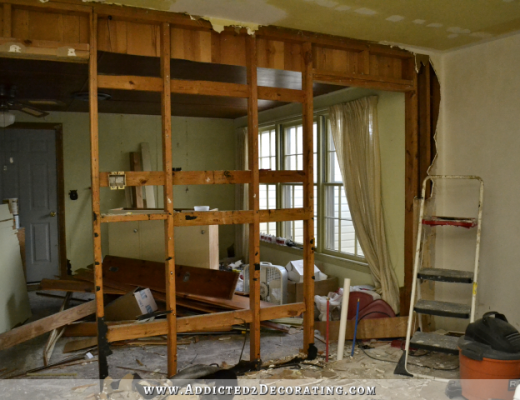 It was an absolutely necessary tool in taking out the wall separating the kitchen and the breakfast room. I’ve used it to cut drywall perfectly around door openings, and even used it to cut out the switch and outlet holes in the drywall (because evidently a Roto Zip is one tool I absolutely cannot use). I used it when installing the hardwood flooring in the kitchen to cut misfired cleats. I used it to cut out a rectangle in the back of the cabinet above the stove for an outlet. My brother-in-law Bill used it to remove the huge metal air ducts from my attic. I used it to cut the nails that were used to install the original drywall in the music room and were poking through the 1 x 10 lumber about an inch into in the bumped back area for the refrigerator. I keep getting a handful of questions asked over and over, so I thought I’d just take a minute (or 30) and answer those here in a post. 1. 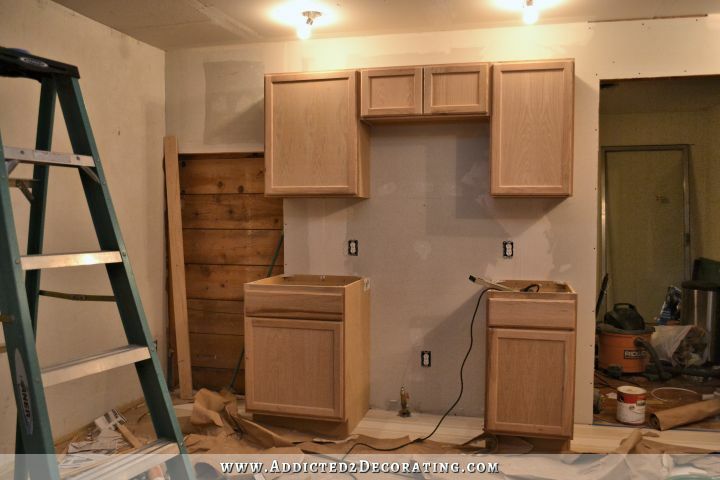 Why did you not prime and paint (or at least prime) the cabinets before installing them? I’ve honestly never seen that done before. During my years working as an interior decorator for clients, I helped with a few kitchen remodels, and I always saw the pros install the cabinets (without the doors), tape and paper everything around the cabinets, and then spray them in place. The doors were generally taken off site to be sprayed and then brought to the site and installed when they were dry. A couple of times, I saw the doors being sprayed on site in an outdoor tented area or somewhere like that. I can’t speak for those pros, but I can only tell you my own personal experience, but there’s is so much prep work that has to be done after the cabinets are installed that it makes no sense at all to paint and prime before they’re installed. For example, the stiles on neighboring cabinets might not be perfectly aligned. Even if they’re off by as little as 1/32-inch, it drives me crazy, so I use my sander to sand those down until they’re perfectly smooth. Nail holes from installing trim have to be filled and sanded perfectly smooth before priming. 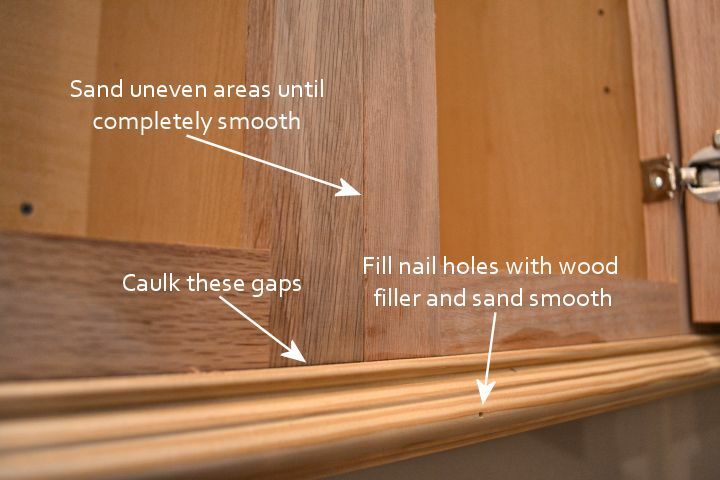 Small gaps between trim and cabinets need to be caulked. Sometimes no matter how hard you try, even if you screw the cabinets together through the stiles just like you’re supposed to, there’s just no way to close the gap completely. I like to fill those tiny gaps with wood filler and use my sander to sand them perfectly smooth before priming and painting. So basically, had I primed and painted them first, I would be sanding off so much of what I had done, and they’d need to be primed and painted again after installing. It just makes sense to install them unfinished, do all of the prep work, then prime and paint. Now with that said, there’s one exception. I do wish I had taken the time to prime and paint the wood columns before installing them. I just got ahead of myself and clearly didn’t think things through, and now it’s too late to turn back. I’m just hoping that my sprayer can get into all of those nooks and crannies. 2. 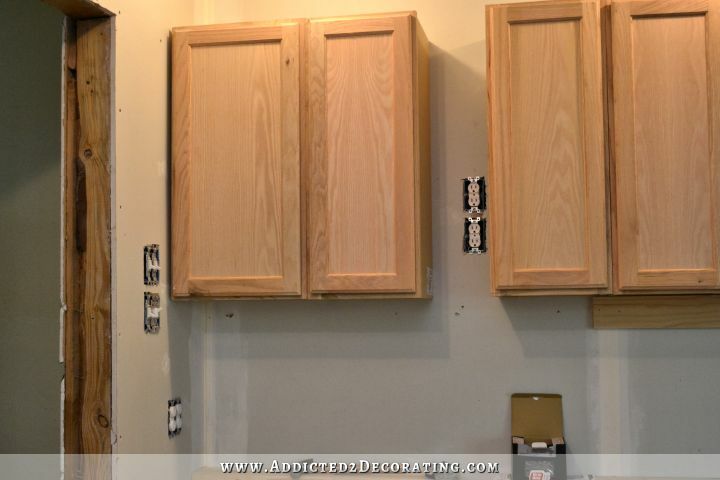 Why did you not remove the backs of the middle cabinets and build them back to the wall? That seems like so much wasted space! I did consider doing that — extending the backs of the middle cabinets to the wall on the wall of cabinets. It came down to me weighing the time, effort, and cost of basically rebuilding the backs of the cabinets against the added storage I would gain and determining whether it was worth it for me. In the end, I decided that it wasn’t worth the payoff. It would have taken at least an extra day of work, would have cost about $30-$40 in additional materials, and I would have gained 4 cubic feet of storage. I didn’t think it was worth it, especially since I’ve decided to forgo the breakfast bar on the breakfast room side of the peninsula in favor of additional storage. However, what I did want was the extra countertop space. That is what I’ll need and use, so I bumped out the lower cabinets. 3. How are you going to paint the cabinets? How will you protect the floor? I’m planning on spraying them. The floor will be protected with lots of precision taping and probably two or three layers of paper taped down really well around the edges. I might even put a layer of plastic (like those thin plastic drop cloths) between two layers of paper so that paint won’t soak through. 4. Why did you get rid of the window? At one time long ago, that window was an exterior window. But somewhere along the way a sunroom was added to the back of the house. We don’t love or use the sunroom in its current condition, but that room will eventually be rebuilt as our family room. And I know that people have different opinions and ideas about interior windows, but this is my house, and I personally do not like interior windows that look from one room to another. About 99.9% of the time, the only reason interior windows exist in homes is because a room was added on, and the window just makes it blatantly obvious that the room on the other side isn’t original to the house. I don’t like blatantly obvious add-ons, and I don’t like interior windows that give them away. Anyway, all that to say that the window served no purpose, so I covered it up. I’ll be doing the same thing in the hallway bathroom where there’s an original exterior window that now looks into the sunroom, into an area that will eventually be the laundry/utility room. I don’t like useless interior windows. Rest assured that if that kitchen window had been an exterior window, I would have kept it, I would have worked around it, and I probably would have kept the sink in its original position under the window and designed the rest of the kitchen around it. 5. Why did you get rid of the old cabinets? They were so charming! There are a few reasons I didn’t reuse the old cabinets. I didn’t like the piled on layers of paint with thick drips all over. I didn’t like the doors that wouldn’t close. I didn’t like the drawers that didn’t open and close smoothly. 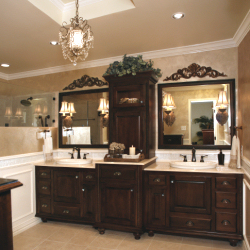 I didn’t like the tiny cabinets at the ceiling that didn’t allow for pretty trim at the ceiling. I didn’t like the chewed up, gouged areas that would have required lots of Bondo. I didn’t like the rotted out back panel that had evidently seen more than a few leaks over the years and was blackened with mold and very brittle. They also just simply wouldn’t work with my new arrangement. As I’ve already shared, my plan was always to cover over that window since it no longer served a purpose. With the window gone, the sink placement didn’t make sense, so I moved it to a more pleasant spot where I’ll be able to look out windows, watch t.v., or visit with visitors while I work at the sink. There was just no way to feasibly and effectively re-use these cabinets with the new arrangement. Bottom line, these things put in their 65 years of service, and evidently did so quite well. I’m sure they were wonderful when they were new, and for the three or four or maybe even five decades following. But now it’s time for them to be retired from service in the kitchen. They’ll still be quite useful in the garage when I use them to create my workshop. 6. How will you access those outlets now that you’ve covered them up? Shouldn’t you have wired your sconces first? Those outlets aren’t intended for everyday use. If I want to plug in a coffee maker, crock pot, phone charger, or anything else on that countertop, I have a total of eight outlets on that wall of cabinets alone available for everyday use — four outlets located on the side walls at each end of the countertop. The outlets between the upper cabinets are for very specific purposes. The top outlets (one on each side of the center section of cabinets) are for the sconces that I’ll be attaching to the spacers that I added to cover the spaces. The bottom outlets (again, one on each side of the center section of cabinets) are for my undercabinet lighting. And those outlets are powered by the top two light switches on the left wall. The undercabinet lighting I’ll be using has a plug in adapter. So I’ll just install them, plug them into the outlets specified for undercabinet lighting, and then use the light switch on the left wall to turn them on and off. The sconces that I’m using are intended to be hardwired. However, I knew that it would be difficult and potentially very frustrating to wire the sconces in that small area behind the spacer. So I’ll be modifying the wiring on the sconces to add plugs. It’s a very quick and easy modification that can be made on just about anything that is intended to be hardwired. Once that’s done, I’ll drill a hole in the spacer, poke the wire through, and plug it into the outlet specified for the sconces. Then I’ll use the light switch on the left wall to turn them on and off. The plugs are easily accessible from the under side of the upper cabinets. If I need to, I can reach my hand up in there and plug in/unplug things. Although once everything is plugged in, I don’t anticipate needing to access those plugs again. I am always amazed at how much you accomplish in such a short amount of time. Also, I have the Dremel Max and LOVE it. We have used it for so many things (such as cutting back plaster and lathe to install electrical wiring) It is my go to tool. I also have my nail/staple gun which I love but is electric. For Christmas this year I will be asking for a smallish air compressor and begin my collection of tools to go with it! Cannot wait to get back to my house in WV (after this work contract in Maryland is done) And continue on work on my old home. You have given me so many ideas. I don’t know where to start. LOL Looking forward to tomorrows post. Carry on my friend, Carry on! When buying your fridge you might want to open the door or doors and make sure you can get the crisper drawers out without opening it further than the wall will allow on that left side. I have a french door fridge and the drawers won’t come out unless I push the doors all the way back to slide them out. Your kitchen is looking wonderful and I don’t question your design one bit – you are the one standing in it, working in it and looking at it. I love love love your updates! She already bought her fridge. I just recently purchased a Dremel Multi-Max and I love it! Don’t feel bad about the roto-zip, we have two of them and they stay at the very back of the shelf and seldom see the light of day. You have my respect and admiration for the wonderful job you are doing and sharing. Ignore the comments from people that don’t know beans about construction and keep up the great work! I believe you said you won’t be installing a microwave above the stove but don’t recall what you will be installing there. Can you refresh my memory? Thanks for all the answers. I find you answer things before I even think it’s a question. Lol. I’m so far removed from doing remodeling work myself. Matt and I haven’t used a microwave in about 10 years, so I won’t be adding one in this kitchen. (We didn’t have one at the condo, either.) Instead, I’ve just ordered a nice (albeit plain) vent hood to go there. That very short 12-inch cabinet above the stove is probably too high to attach the vent hood right to it, so my brother-in-law Bill had an idea of adding a shelf there for spices. I’ll probably end up doing that so that the vent hood will be lower (i.e., in the appropriate spot). 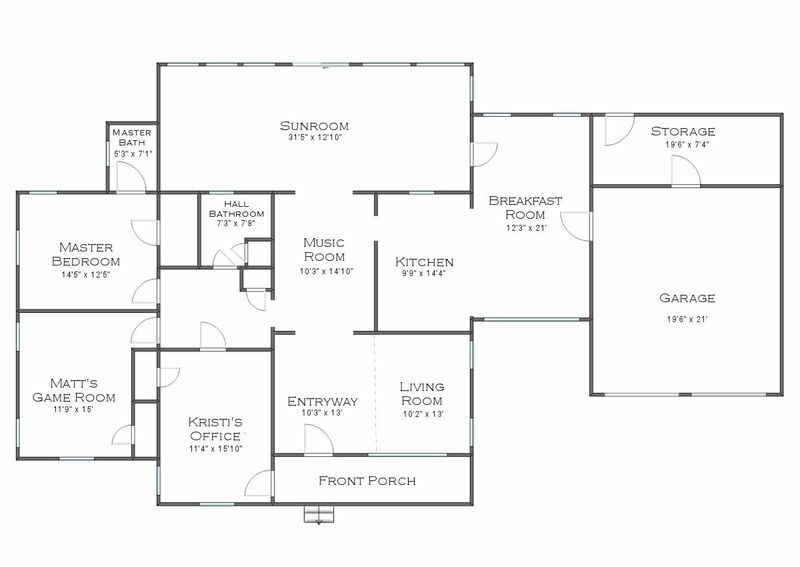 It’s supposed to be delivered today, so I’m waiting to get my hands on it and actually see it in the kitchen before I make my final decision on what I’ll need to do with that space. I agree with you on NOT trying to renovate the old cabinets. They look very 1950s and since you are not going for a retro look, they just wouldn’t work. I’m enjoying watching you transform stock cabinets into custom cabinetry. That’s what defines the amateurs and the pros. One question I have (I’m not criticizing, just asking). My husband is in a wheelchair also. With your fridge in the corner, will your husband be able to get the door open easily? You have a cabinet next to the fridge, which I firmly believe is necessary because you need a place to set things down while you are putting them in/taking them out of the fridge. But since I don’t know how wide your kitchen is and how much clearance he needs for his chair and the swing of the door, I was curious. My husband is constantly either bumping into the cabinet behind him or bouncing off the fridge. We have a TINY kitchen. Matt and I talked about different locations, and this was one that he thought would work best for him. We had it like this at the condo, so he’s used to it. 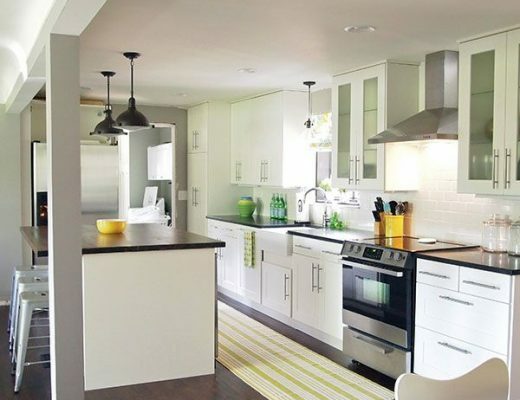 At one time, I had considered a U-layout for the kitchen, with the refrigerator going on that end wall (opposite the wall of cabinets, on the wall that will now be empty) with two banks of cabinets on either side. Then we realized that that would be the absolute worst location for him since he’d have to get to it from straight on. That would be almost impossible in a wheelchair. A side approach seems to be the best. I, too, am amazed at what you accomplish in such a short period of time. I look forward to seeing what comes next. I hope you don’t mind me commenting on your post. I have painted several cabinets and have left the inside original and painted it. It depends on what you want to see when you open the cabinet and what will be stored. In our basement the cabinets aren’t painted inside (the doors are painted inside and out) because the kids are storing things, and I didn’t want it to get too chipped. Our bathroom cabinet was painted inside, but it sees very little use. If I was painting in my kitchen where damp dishes could come in contact with the paint, I wouldn’t paint the inside. But it really is up to you, there are no rules. I agree with Susan. Not necessary at all to paint the inside of cabinets. 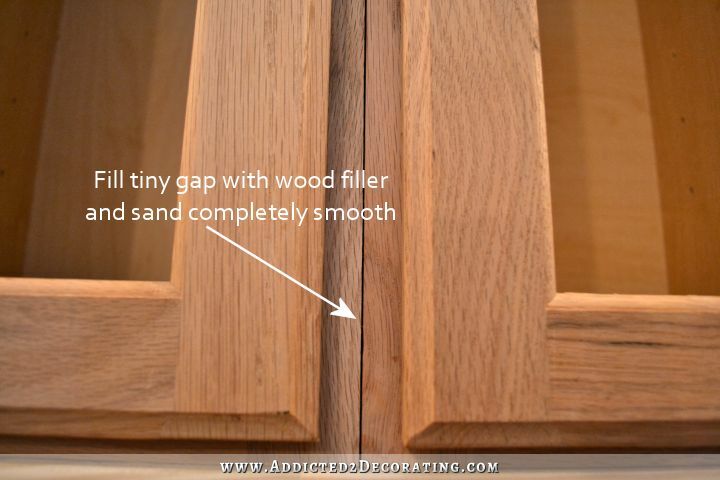 In fact, if the inside surfaces of your cabinets are in good shape as they are, I’d actually recommend not painting them. Once you paint, you have to deal with the paint getting scratched and dinged as you slide plates, glasses, and other items across it continually, and the you have to deal with the upkeep and repaint the insides every so often to keep them looking nice. I generally paint both sides of the door, and then all of the framing around the cabinets that can be seen. Then if the inside is nice, I just leave it alone. Kristi, You. are. the. bom !! Moving right along….looksgreat. Didn’t realize you were going to spray the cabinets. That scares me! Not spraying, I plan to spray my doors and drawers and any thing else I can remove, but the frames have to be done inside and I an too scared that I would get paint every where. I plan to use a foam roller as much as possible and I am usind a self leveling paint so the brush strokes are not suppose to show. I am just waiting for you to finish so I have an accurate picture of the pitfalls. Having yourblog to follow is like having a pro right in the room with you. When my husband was in college he worked for an electical company in the summers so he knows all about outlets etc. I am going to take a page from your book and have him teach me how to change a switch and an outlet. I will write it all down, and draw a diagram, just as you did. Once i hace that, piece of cake! Thanks again for showing us that we can step out side the box once in a while. I know there are two of those dremol things in this house somewhere. I plan to find them and remove the piece of ruffled decoratice wood that spans the windowin my hitchen. I hate it and everyone keeps saying you cant remove it. Well surprise surprie surprise, it is going to happen! Love it! I agree on the dremmel. I’m curious about fixing the wonky doors on the stock cabinets. I am slowly buying my stock cabinets to redo my kitchen and I’ve noticed the wonky problem, but I don’t know yet how to fix it. Love the dremmel tool idea for avoiding buying a router. I will employ that when I do my cabinets in a couple of months. Well, darn. I keep forgetting to show about the doors! It’s really quite simple. 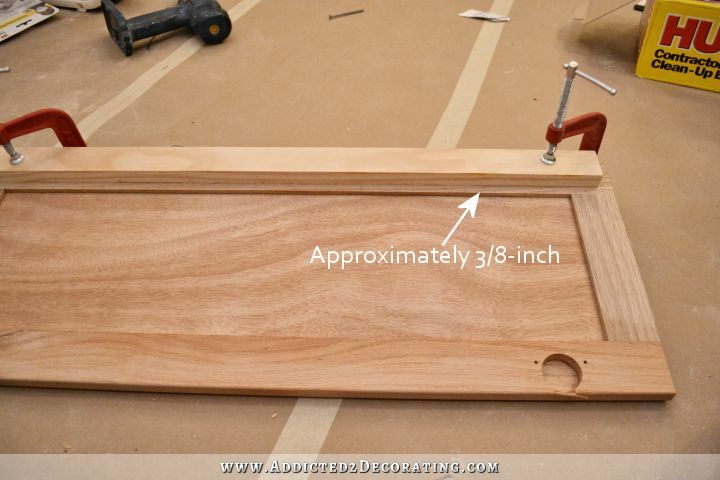 I take a short piece of square dowel rod (I think the one I’m using is 5/8-inch) and place it right below the door. Then I unscrew the two screws holding the door to the frame, and let it drop down until it rests on the dowel, and then re-screw the screws into the frame. That’s the abbreviated version, but that alone usually gets them looking pretty good. I’ve actually given it some thought, and I’m leaning towards seeded glass. I love the subtle texture (is that what you’d call it?) of seeded glass. I don’t want anything that’s too distracting or eye-catching. Awesome way to cut the area out for the glass! Why didn’t I think of that? I already have the right tool. You constantly amaze me with how smart you are! I am loving watching your design come to life day-by-day. I’m finishing my simple kitchen and giving my mom’s kitchen a cosmetic face-lift this summer, so it is more than perfect to see your process in your own kitchen. Thank you. Wow! everything looks great, you have a gift and lots of determination! I know what it is like having old, old cabinets, ours are built right into the walls. Also they have leaded glass fronts, which is a love hate relationship. I ended up covering them up with fabric as they have ugly yellow mactack inside, some of the backs have cracks where plaster is coming off. Years ago we painted the outside of them dark green and that worked out well…for awhile. Of course we have no money to replace them, I avoid the kitchen, but love to cook and until recently realised that our kitchen is very dark maybe that has something to do with it. Cannot wait to see your finished kitchen! We just had our fridge replaced. When we wheeled it out from the where it’s been sitting for the past 10+ years I couldn’t help noticing how much dust had settled in the vent where air is exchanged to cool the compressor. It’s not like a dusty vent will kill your fridge, but I learned that it makes the fridge work harder and it’s less efficient. My delivery guy said keeping them clean can save $10 a month electricity. Maybe your fridge has these coils in the front, behind the grill., but if not, will you have access to the rear of your fridge? With cats, the coils get clogged even faster. Just saying. You are doing a beautiful job! You are an inspiration!. I’ll be able to wheel it out if I need to clean back there. But I looked at the back, and mine doesn’t have coils. I know my last fridge had coils visible on the back. I wonder where mine are on this fridge! I hate to ask this, but (oh, don’t hate me for asking) couldn’t bugs get thru where you aren’t putting wall board? Or the outlets that you forgot to cover? And I’m also planning on putting the outlet covers on. I’ve made it much more difficult on myself, but I can still reach my arm up in there and add the covers. PS: About those “charming” cabinets, thankfully I’ve never had to deal with anything like that, but my in-laws had some that look similar (FIL may have even built them himself, I’m not sure) but they were basically pieces of plywood cut into shape for doors, the drawers opened hard, they just weren’t very efficient. I totally understand your need to replace them. Personally whenever I see a “charming” dresser, the first thing I do is to see if the drawers work – it would drive me batty to have to deal with something like that constantly. Wonderful, clear answers with humor! I did wonder why you didn’t prime/paint the wood columns. Now I know I wasn’t off my rocker! This is going to be gorgeous! I forgot what you had decided to do; did you have room between the wall and refrigerator for a broom area? The kitchen is looking sooooo good, and I also am continually at how much you get done in a day’s time! can’t wait to see what you’ve come up with! I love my walk-in pantry! Oh Kristi, it makes me laugh all the questions and doubts you put up with. Thanks for your patience with all of us! 🙂 And, it’s looking goooood. Great job answering all of the questions. 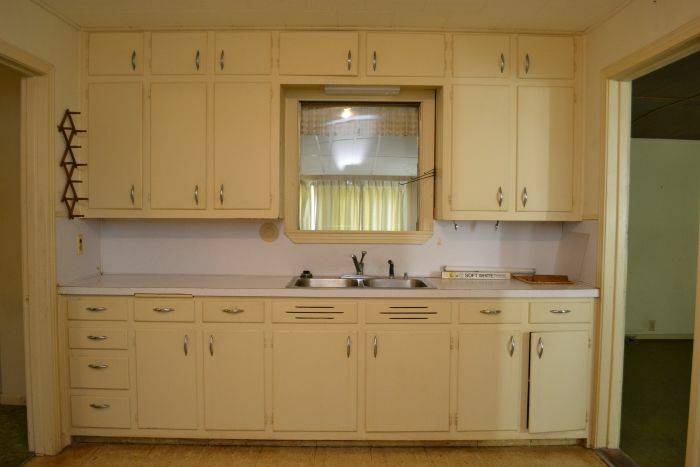 I, too, thought the old cupboards were charming but in a ‘retro’ kind of way. Since you weren’t going for a retro look they needed to go bye-bye. I am glad that you will repurpose them for your garage workstation. I’m sure you will hang them and spiff them up. Also, I do love that you’ve recessed the wall where your refrigerator is going. How nice to have that in line with the cabinets – very useful and its nice to have a bit more floor space to move about the kitchen. Well thought out! You accomplish so much and should be soooo proud of yourself! What size is the opening for the refrigerator? What if you want a larger refrigerator later? Is there enough space between the wall and the refrigerator so that the door opens enough to get the drawers out for cleaning. Are you concerned with having enough air flow in the back? Where is the outlet for plugging in the refrigerator? Sorry just a few questions. But I love how it’s coming along. I’m not concerned about air flow. The manual for my fridge says it needs 1/8-inch on the sides, and inch in back, and an inch on top for proper circulation. I have more than enough on the sides (2.5 inches on each side), and I haven’t built the top yet, so I can make that any height it needs to be for the proper clearance. The only thing that’s close is the back. I’m still deciding if I think it’s enough, or if I need to bump out that wall a bit more. The outlet is on the side wall towards the bottom corner of the wall. That’s a new outlet that we installed specifically for the refrigerator. First, I find myself running to my computer every day to see your daily progress. It is like reading a novel that one just can’t wait to get to the next page! It is SOOO amazing what you accomplish in a day, week, month, etc.! Secondly, when I had a wood ceiling installed, I primed and stained it after installation. I was told that this ensures that it has an even finish. So, the answer as to why one doesn’t prime and paint the cabinets until after installation. That floor looks so awesome already…So glad (as if my opinion matters–lol) you changed it, even it was a major bummer to have to redo it! So soft and inviting. That’s all…you are the expert! This is really timely. I read that you were going to spray paint your cabinets and you purchased the critter paint gun. I have one also and I’m about to paint my MDF bookcases; but first I have to prime. I’m using an oil based primer. Do you know if you will be thinning the primer for the sprayer? I usually thin my latex paint, but I’ve never thinned oil based paint before or used oil based paint in my sprayer – and – this is the first time I’ve ever painted MDF. 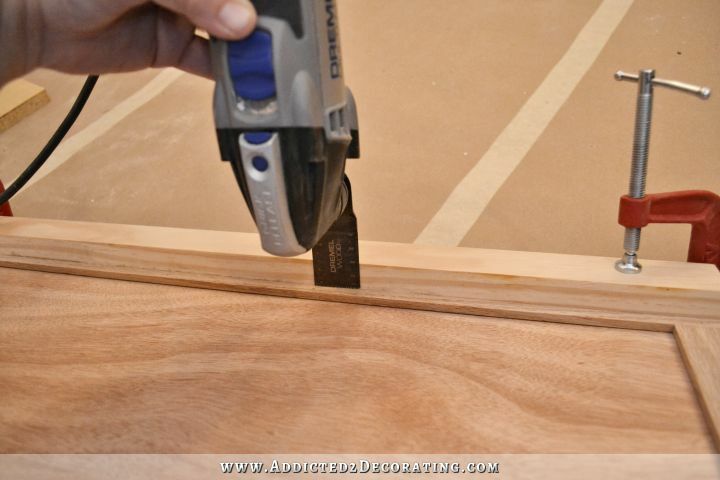 all the blogs say, including yours, to use oil for MDF, so I was hoping to get your advice. I think if I were you, I’d just use the primer without thinning first, and spray it on a scrap piece of MDF or something else just to see what kind of coverage you get. Then you can adjust from there and thin it down if needed. You’re a very good teacher Kristi, so thoughtful. You work like lightning. I can hardly believe you are doing this so quickly. I thought it would take you years to even get to the kitchen. Shows how old I’m getting. LOL. Oh wow!!! I love that!!! I’m pretty sure I’ll need to make myself one of those. 😀 Thanks so much for sharing it with me! You know I love ALL of the herringbone things! I understand as it is a beauty. I knew you would love it. She does a great job. Thanks so much for all you share about your projects! You are a wealth of information and I always get inspired by reading your posts. Now, to get up and do something! Thanks so much for all you share about your projects! You are a wealth of information and I always get inspired by reading your posts.This is going to be gorgeous! Looking fab as usual, you are a very good teacher Kristi, so thoughtful. Wow! Everything looks great; you have a gift and lots of determination!